The Sri Chinmoy Oneness-Home Peace Run started in Porto, Portugal. Watch this inspiring report (subtitles in Portugese). Here is a faksimile print of an article recently being published in the Kopavogsbladid. 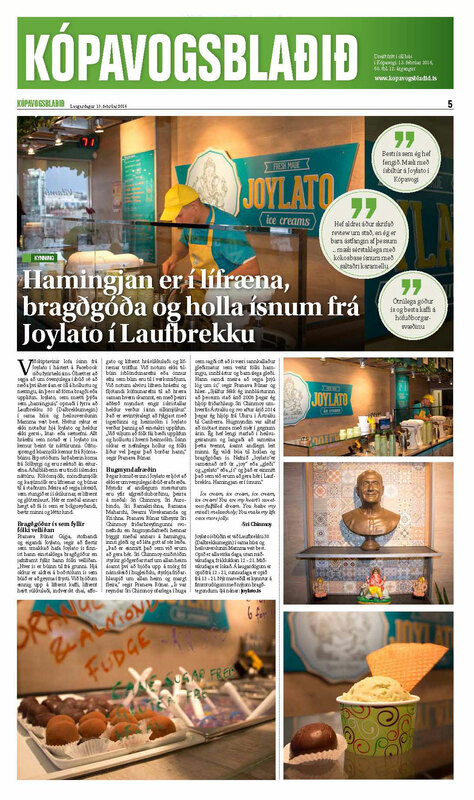 Joylato is the first Icelandic icecream shop working with the new N2 system, allowing an immediate and individual icecream after adding N2 to a prepared mix of milk or alternative milk. The owner of the Divine Enterprise, Pranava, is happy with the start and the feedback. People say it is the best icecream in Iceland. Pranava also plans to open a second Joylato shop in downtown Reykjavik this spring, combined with a Health Food Shop, just 30m away from the restaurant Ecstasy’s Heart-Garden, also operated by students of Sri Chinmoy. The Torch, The Independent Student Newspaper of St. John’s University, published a review on the Panorama restaurant, operated by students of Sri Chinmoy in New York. When you think of dining at a local café, meditation may not be the first thing that comes to your mind (certainly not in the daily hustle and bustle of Queens, New York). However, there is one particular place that will, without a doubt, nourish both your body and soul. The Panorama of my Silence-Heart Café, located on Parsons Blvd, is inspired by a spiritual teacher named Sri Chinmoy who lived from the 1960s until 2007, according to the café’s website. In fact, Sri Chinmoy’s meditation students are those responsible for the management of the establishment. The environment inside the café is that of sheer tranquility. It is hard to imagine a New York restaurant/coffee shop to be such a peaceful environment, but it is certainly possible at this joint. What better way to soothe a stressed college student’s mind than with a nutritious menu? The selection at Panorama includes vegetarian, vegan and gluten-free options for our friends with specific dietary needs. Need a pick-me-up? You can order a coffee beverage called “Instant Happiness,” which consists of a double shot, cream, vanilla and caramel. Let me know if you can sip this without smiling. The menu also features a variety of teas, fresh juices, smoothies, salads, sandwiches, desserts and breakfast options made with free-range eggs (whether or not the range of your eggs is important to you). As a pineapple lover, I indulged in the “Tropical Dream” smoothie made with banana, pineapple, strawberries, coconut milk and a little bit of love. It paired quite nicely with the breakfast wrap. I know what you’re thinking: a classic breakfast burrito chock full of red onions, black beans, eggs, a multitude of cheeses, dollops of sour cream and diced tomatoes covered in hot sauce. That is not the case at Panorama. The breakfast wrap is comprised of scrambled egg, pesto, avocado, tomato, lettuce and cheese. Although it contains similar ingredients to a traditional breakfast burrito, it does not come with all of the guilt. You can taste the fresh factor of each ingredient. St. John’s senior Justice Beckford found love in a hopeless place as a vegetarian seeking quality food. “The food and beverages solidify Panorama’s intent on making your eating experience not only all-natural, but all delicious and fresh,” he said. “For people with diets that stray from the world of meat and fried foods, Panorama Café is definitely a nutritional oasis off the beaten path.” Even Panorama’s grilled cheese will leave you feeling inspired. The restaurant’s take on this simple item hits the spot. For a mere $2.95, you have a choice of regular or whole-wheat toast with cheddar, American or Swiss cheese. Whether or not you meditate, the quality of this food will lift your spirits (Disclaimer: This is not a proven fact). However, there are scientific facts out there to prove how eating better food can improve your attitude and happiness. Take that information and run like the wind to potentially make your life easier on a day-to-day basis. A bilingual poetry book titled “Premaloker Kanan” (The Garden of Love-Light) by Bangladesh-born poet, painter, musician and mystic Guru Sri Chinmoy was launched on January 30 at Bishwo Shahitto Kendro in the capital. Professor Emeritus Anisuzzaman presided over the programme and unveiled the book while writer-researcher Professor Karunamoy Goswami spoke on life and works of Sri Chinmoy. Shantisri, a Scottish-American disciple of Sri Chinmoy, delivered welcome address at the event. She is now in Bangladesh to initiate Sri Chinmoy Centre: one in Dhaka and another in Chittagong, the birthplace of Sri Chinmoy. Journalist Munni Saha emceed the event. Sri Chinmoy (1931-2007) first wrote the poetry book in Bengali, and then, set them to music. He, later, translated the book in English. Karunamoy Goswami wrote introduction of the book. “It is wonderful to think that there is a garden, a garden of love, a garden of love-light. It is even more wonderful for me to think that in New York, a modern day mystic like Sri Chinmoy, believed that the world still was a garden where human beings blossomed like flowers, and that cosmic love was still there to illuminate them with its amazing light,” mentions Goswami. Professor Anisuzzaman recited a poem from the book while Shantisri read out the English version of it. Rintu Chakravarty from Singapore rendered several songs from the book at the event. A charismatic personality who created countless paintings, published 1600 books and left behind around 10000 disciples (naming them with Bangla names) across the world, Sri Chinmoy is best known as a man of peace for his fortnightly meditation programmes at the United Nations in New York. He received the Médaille d’Or (Gold Medal) for literature from France and the World Peace Literature Award from the University of Washington, USA. This is his third book in Bengali. Apart from this, “Paramanande Path-e” and “Dibbya Purush” have been published by Balaka Prakashan. His book on meditation will be published in Bangladesh next month. A biography of the legend titled “Achena Sri Chinmoy” has been written by prominent Indian writer Shankar. He wonders why a man who is so renowned in the world at large is still relatively unknown in his birthplace. A world record was created when one of his poems, “Precious” was translated into 203 languages and recited at a programme in New York. An international all-male a cappella choir, “Oneness-Dream” present songs of Sri Chinmoy, this time in the Basilica of Our Lady of Mount Carmel in Valletta, Malta on January 16th, 2016. Filmed and edited by Kedar Misani. Sri Chinmoy saw music as a pure language of the heart, a pathway to meditation, an expression and revelation of the Divine. His songs, flowing from the depths and heights of meditation, were composed spontaneously, and are unadorned with harmony or accompaniment – just the purity, beauty, simplicity, intimacy and immediacy of word and melody. For Sri Chinmoy, all faiths are branches of one life-tree. In addition to his own words, he has set music to sacred texts from Christian, Buddhist and Hindu traditions. “Oneness-Dream” celebrate this oneness-in-diversity by singing in places of worship of all faiths around the world, these sacred places the perfect setting for songs of pure devotion to the highest and inmost we all share. The members of “Oneness-Dream” are disciples of Sri Chinmoy, following his spiritual path of meditation and service. None are professional musicians. The members come from many countries and range in age from their 20s to their 60s. “Oneness-Dream” have recorded two CDs – In Vastness-Peace (2011), from a tour of the churches of Iceland; and In Oneness-Light (2012), sung in the temples and pagodas of Myanmar.